The Hudson Bay begins to freeze over and create icy conditions for the wildlife around the town of Churchill, Manitoba. Pools of water seem to still be able to break through the icy conditions of the Hudson Bay in Churchill, Manitoba but as the weather begins to get colder, the pools will also disappear. These wintery conditions is just what the Polar Bears around Churchill, Manitoba have been waiting for but it is still not thick enough for them to venture upon in search of ringed seals. 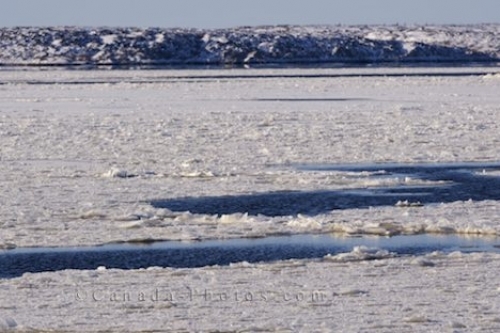 Pool of semi frozen water in the town of Churchill, Hudson Bay, Manitoba, Canada. Picture of the icy conditions that exist around the Hudson Bay in the town of Churchill, Manitoba in Canada.